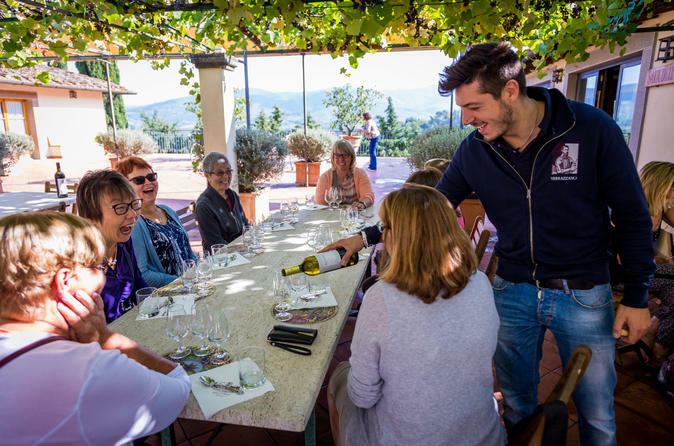 Combine a tour of Tuscany's castles with tastings of some of the region's famous wine during this 10.5-hour tour from Florence. Spend free time in the charming town of Greve for lunch (own expense). Admission to two privately-owned castles and wine tastings included. Begin your adventure into the magic of Tuscany from your meeting point in Florence, where you will meet up with your expert local guide. With your group of 25 people or fewer, climb into a private coach for the hour-long bus ride to your first stop: Verrazzano Castle. Take a tour of the medieval castle, which is privately owned, and imagine what it might be like to live there. Continue to the wine cellars, which date back to 1150, where you'll enjoy a 3-flight tasting of Chianti, including a Chianti Classico DOGC accompanied by castle-made balsamic dressing, pecorino cheese, and local extra-virgin olive oil. Back on the bus, travel about 20 more minutes to the town of Greve. Spend some free time exploring and hunting down a place to eat lunch. Your guide will be happy to suggest a restaurant or cafe in town to suit your taste. Depart for Brolio Castle, privately-owned by the Ricasoli family since 1141. Learn that one of the castle's owners created the first Chianti 'recipe' in 1872. During your guided tour, walk the ramparts around the castle, visit the family chapel, and stroll through the formal Italian gardens. Taste the castle's wine and get the opportunity to purchase olive oil, honey, and jam made on site. Return to your original departure point for drop-off at the end of the tour.